The sum of Galactic Wizard (34) + Galactic Dragon (21). 55= 2 x 5D archetypes. The 19:19 Crystal Matrix is a 5D-6D matrix, inside of the system there are 2 double terminated crystals. The two crystals represent The Votan Twins. They also represent your 5D self, and your twin 5D self as it interacts with the 6D. Pacal and Valum Votan manifested into the 4D Time Matrix through the 19:19 Crystal Matrix. We too have entered in a similar way. The unification process of the twins has already been completed through the Prophecy of the Pyramid and the Cube. Through this prophecy, the Votan Twins entered the 6D. I had the pleasure of creating the welcome party and through the process assimilated the higher archetype of the Votan and connected it to the Merlinian 7D source. The 19 code, is derived from the double terminated quartz crystal. I have used this system for the past 11 years. And through it I have entered the higher self of Merlin. I created and completed the Prophecy of the Pyramid and the Cube, The Dragon was Awoken, and the Twins entered into the Votans Stone. By fulfilling this prophecy, it leaves a clear path for you, the initiate to follow. Another layer to this system has been released to me during the most recent solar flare ejection from the sun between kin 53-54 (thank you Ruben113 for pointing that out ). It brought me further evidence derived from the life paths of the Votan as to the relevance and precision of the system I present in this blog, and how they were intrinsically embed within it. Continuing from the last blog post The Sirius Connection. I am overjoyed to present another punchline of the Great Cosmic Joke. This one really is HILLarious and I hope beyond anything, when you stop taking everything so Siriusly, you can really see the funny side of whats going on. All recipes for icing begin with a large mound of sugar. Well, Votans Stone has replied to my comment in the most peculiar form, and has lead me back in time, to August 1st, 2007.. to Sugar Hill, Wiltshire, UK. How ironic, that this crop circle would appear on Sugar Hill.. Cosmic LOL… How ironic it would create the perfect icing on this inter-dimensional cake. On this day, Kin 60, Yellow Galactic Sun in the Dreamspell & Kin 11 (Spectral Monkey) in the Long Count. A crop circle was discovered. Please note, it was only discovered. It was manifested the evening of Resonant Storm kin 59. The same birth kin I attribute to Pacal Votan through Deciphering the Riddle of The Votan. Kin 59 It was also the final year in the process of The Tube. The activation of the Cosmic Trunk, the centre column of the 19:19 Matrix Pyramid – The Blueprint of the Temple of Inscriptions. Jose has implemented a great representation of what the circle could indeed imply. However, upon investigating this crop circle, its harmonics etc, I begun to incept a different pattern into the emerging geometry. Maybe you can see it now. My vision is bound within the 19:19 Matrix, so, upon discovering this crop circle and the relevance of it to the transmission received by Valum Votan, I have time travelled back to the conception of this circle, and embedded a whole new 7D understanding. An understanding that connects divinely with all the work I have presented through this blog, and that forms the backbone of the 19:19 Crystal Matrix. An understanding that is incepted by the highest dimensional wizard, Merlin. A 7D inception of the Crop Circle. I stumbled upon this on kin 54 in the Dreamspell 4D Time Matrix. White Lunar Wizard. 19 Step sequence represent the 19 angels of the 19:19 Crystal Matrix. The 18 cubes represent the 6 x 3 facets of the double terminated quartz crystal. As the cubes form they leave space and reverence to the 19th Angel in the centre. The centre is the hidden clue and divine connection. It is essentially Merlins invocation. It is the 19th centre of the double terminated crystal. 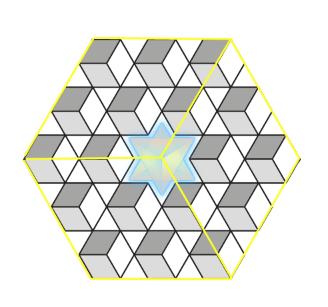 The 18 cubes + centre = the 19 day sequence of the 19:19 Crystal Matrix. Upon completing the activation of each facet, each angel, you enter the centre of the crystal which is represented as the Merkaba. Futher examination of the central geometry reveals a 5x5x5 cube. The total sum of the larger cube, if all cubes were present is 125 cubes. If we then add the 18 cubes that appear. 125 + 18 + Centre = 144 = 12 x 12 or 4 x 32. Regarding the 5 cubed. This represents the 5D archetypes that unite in the 19:19 Crystal Matrix. How synchronic that I would discover this hidden code between king 54 and kin 55. Kin 54 is present in the number of cube faces. 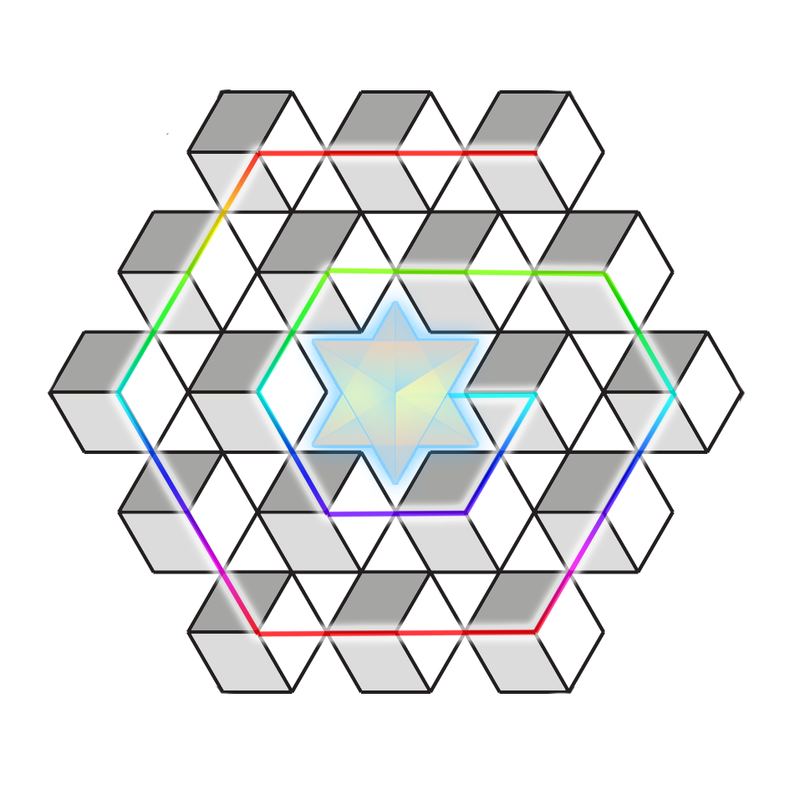 Kin 55 is present in the 5 x 5 face of the greater cube. How ironic, that it that the crop circle would be discovered on the day that kin 11 Long count / kin 60 Dreamspell synchronise. The Votan Twins mirrored and united in the 6D. 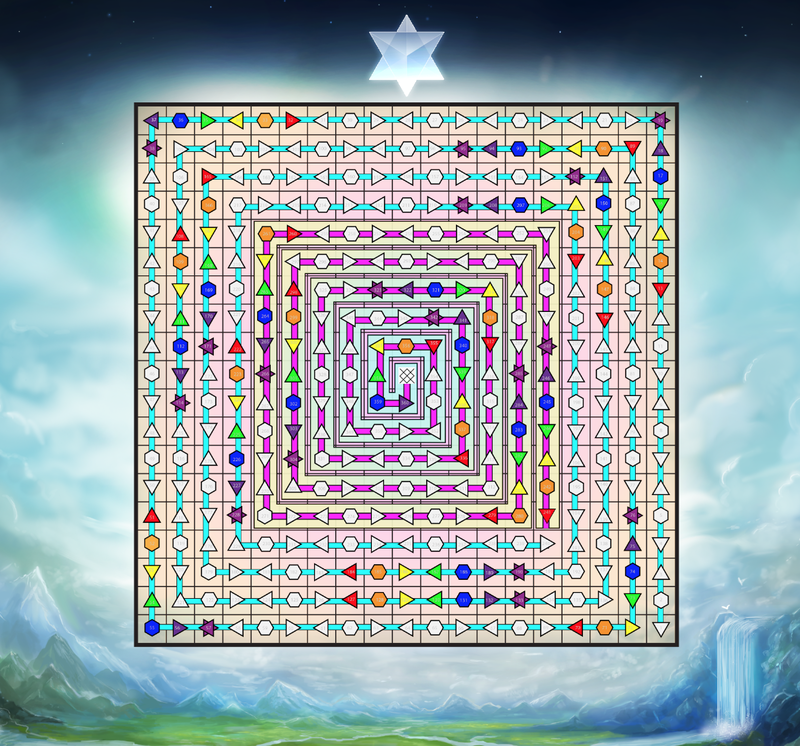 The Dreamspell and Traditional count synchronised with 49 kin difference (7×7) and represents the inception of this circle from the 7D. As I mention above, the Crop Circle was created on the night time between Resonant Storm-Galactic Sun. This proves the theory I presented in Deciphering The Riddle of the Votan that Pacal Votan was actually born the night before but crowned Galactic Sun the following morning. This gives confirmation of the subtle irregularity which anchors Day 241 of the 19:19 Matrix as the day when the 2 crystals of the matrix, the 2 x 5D Votan archetypes, would unite through death and birth (March 23rd). 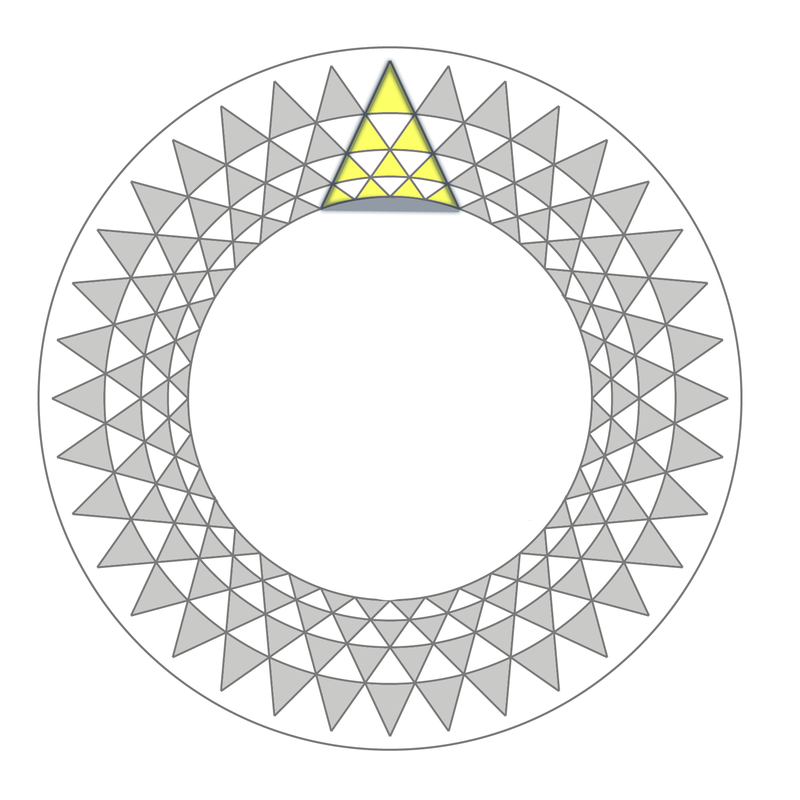 As Jose Arguelles declared, there are 36 x 4 triangles that make up the outer rings. 36 x 4 = 144. Which is the biblical number of the elect. 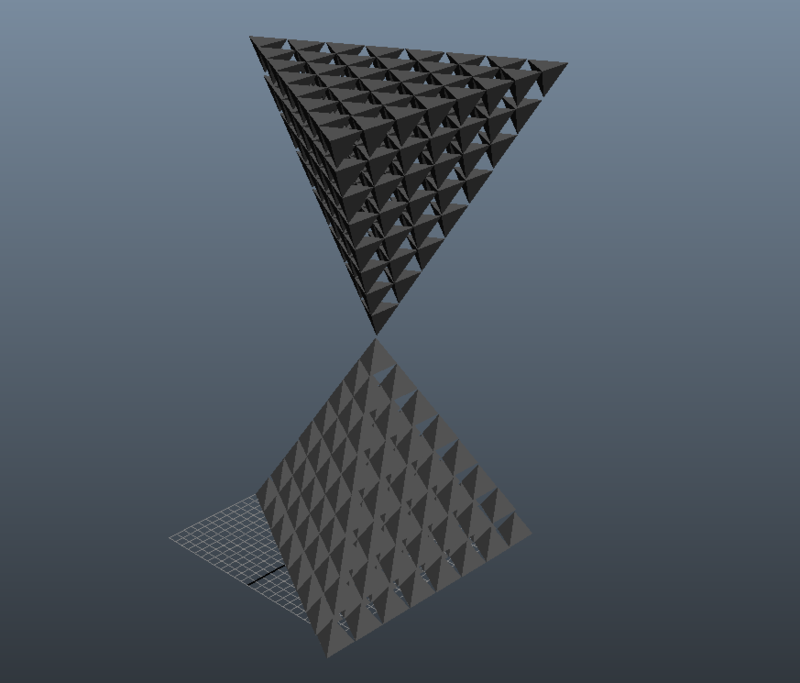 However delving deeper into the code, we begin to see that the 144 triangles can be interlocked as presented below. Each of the 36 points of the outer ring (the petal or feathers) represent a triangle of 10 triangles stacked on top of each other. The outer ring of 36 points spins like a wheel, each petal of the flower contains 10 triangles, which represent a 10 day sequence. This 10 day sequence signifies the 9+1 levels of the 19:19 Crystal Matrix in Pyramid form. The blueprint of the Temple of Inscriptions. The 10 unified triangles of each of the 36 points form part of a spinning wheel system, unifying time and space through the interlocked triangles. 36 x 10 triangles + the centre = 361 (19×19). 10 is a tetrahedral number and falls part of the tetrahedral time theory I presented earlier in this blog. I realised that if each triangle represented a tetrahedron, then each point (36) on the flower, each 10 days ( tetrahedrons ) activated, would create a perfect tetrahedron of 3 levels. Each of these constructions, work towards the 120 step construction of the 8 levelled tetrahedron required to build the opposing aspects of the Merkaba, as presented in the The 19:19 and The Merkaba Activation. This is the walk that crystal 2 makes on the 19:19 Matrix. Here we see it mirrored in the outer ring of this crop circle. So, it is clear that the wheel around the outer ring of the crop circle, synchronises perfectly with the 19:19 Crystal Matrix. It synchronises perfectly with the process of creating the yearly merkaba. It takes 12 petals of the flower, 120 tetrahedrons to create the 8 levelled tetrahedron I quoted back in 19:19 and Merkaba activation. These 12 petals create the 12 star light key ( the design of the New Jerusalem as described in the Book of Revelations). To fulfil the cycle, it requires 3 stages, the masculine, the feminine, and gestative periods. A total of 36 points. Remarkably, the crop circle that Valum Votan presented as his inspiration for the Synchronotron, is, a perfect, circular representation of the 19:19 Crystal Matrix. He did always say it was a inter dimensional portal created by the Wizard after all. What we have attained now, is the 19:19 Crystal Matrix encapsulated in Square, and Circular form. Just like the Cube and the Sphere found in the hands of Pacal Votan. What we see through this crop circle is divine confirmation from both Pacal and Valum Votan of the 19:19 Crystal Matrix. The circle was created on kin 60 (Pacal Votan) in the Dreamspell, and kin 11 (Valum Votan) in the Long Count. A perfect mirror. Of course this is just the icing on what was already a very solid and well baked cake. The 19:19 Crystal Matrix as a Circle. 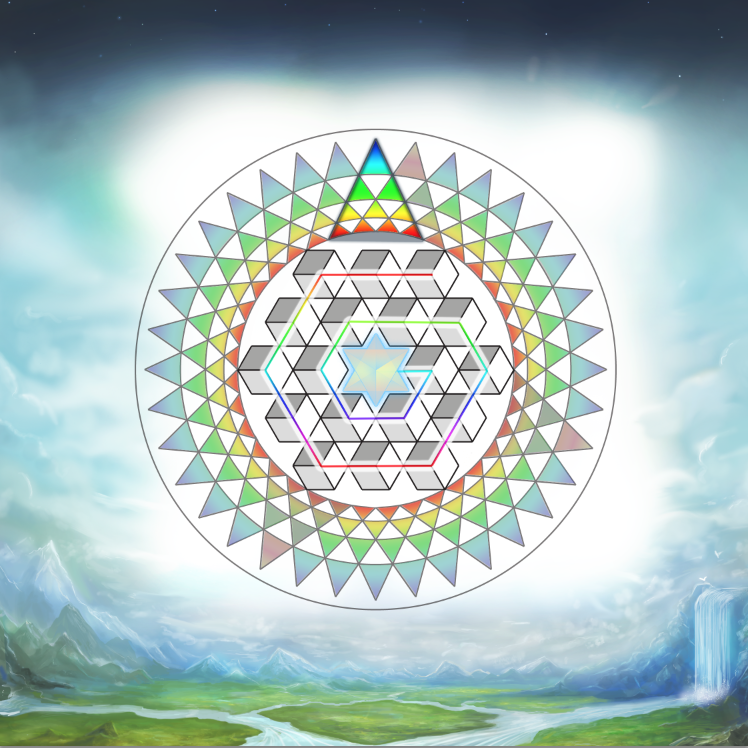 The Circular 19:19 Matrix – The activation of the tetrahedrons in the outer circle, create the perfect higher dimensional basis for the formation of a rainbow bridge around the crystal core of the Earth. The petals of flower also represent the feathers of Quetzalcoatl. Endless confirmations of the infinite story that is bound to this dimensional construct I have the pleasure of presenting to you. Now, as this prophecy has been completed and all the layers are here. You, as Earth Wizards, have the tools to follow through. I will present the full pack of information in the next few days. Just as the process and ascension of the Votan proves. By using this tool you begin to transmit your 5D energy to the crystal soul of the Earth, the crystal core. Give it to Gaia..
Once enough 5D energy is attained, the 4D Time Matrix will begin to work in reverse. I will explain more about this further in this blog. This is a magical act that is performed through the collective use of the matrix. The artificial 12:60 timing frequency has been born from the manipulation of the stable frequency emitted by quartz crystal. Through the 19:19 matrix, this frequency is re-aligned to the 4D Time Matrix. This is why the Dreamspell was incepted so perfectly aligned with the Prophecy of the Pyramid and the construction of the Great Merkaba which we have just entered. Pacal & Valum Votan have left some very important signs for you to believe. I have acquired these signs from my 7D Self, Merlin. It time to wake up dear kin… and see the higher dimensional structure of reality. Its time to go beyond 4D.. realise your 5th Dimensional nature.. and submit to your dimensional self through the path of initiation forged by Votan. Invoked by the highest self of Merlin..